I was born the son of two hippie parents and raised on a farm in between Hallsville and Centralia. When I use the term “hippie,” I don’t mean it in the stereotypical drug-induced flower power way. My parents were social activists who saw things like professional sports as distractions from real issues that we needed to face as a society. When taking that stance into account, you can understand why I didn’t really care for sports, let alone understand why people found them so fascinating. All of that changed when my sister Wendy became a cheerleader for the Kansas City Chiefs. Wendy is 13 years older than me and she was the epitome of an all-star cheerleader. She was captain of her squad in high school, which went on to win the State Championship in competitive cheerleading. In college, she was the captain of the NMSU (now Truman State) Showgirls and a Kirksville celebrity in her own right. As a result, I found myself going to countless sporting events that I just didn’t care about. I was bored by it. I couldn’t comprehend why people put so much of their time into watching a ball go from one side of the field to the other. After college, she moved to KC and joined the Chiefs’ cheerleading squad. As a show of support, my father and I went to see her cheer at Arrowhead Stadium and nothing was the same for me after that. “CHIEFS!” the crowd boomed. It literally made me jump. The sound of 80,000 fans shook me to the core and I knew I had a second home at 1 Arrowhead Drive. While my sister was a cheerleader, I went to many more games. I even participated in some halftime shows, getting to meet such legendary players as Marcus Allen, Neil Smith and Derrick Thomas. My love of the organization hasn’t waned a bit. My wife and I were there when we took the world record for loudest stadium (142.2 db) while beating Tom Brady and the Patriots 41-14 on “Monday Night Football.” My band Decadent Nation has now played at Arrowhead on six separate occasions, warming up the masses as they pour in. Tailgating at these games is a rite of passage for NFL fans. There’s a reason why Arrowhead is considered one of the most iconic stadiums in the league. There’s a reason why the tailgating in KC is recognized as some of the best in the NFL. Kansas City is well known for its barbeque and that no doubt has lent itself to the lore of walking through the parking lot swollen with grills, hungry fans and the mouthwatering scent of smoked meats in the air. There is truly nothing like it. It is almost ritualistic and you feel a sense of family with your many thousand neighbors. When I decided to write a piece on the Chiefs gameday experience, I knew I wanted to do something special. I loaded up a passenger van full of friends and a cargo van full of grills and my motley crew made our way from Columbia at 6:30 a.m. on Sept. 17 to watch the Chiefs take on the Philadelphia Eagles at the home season opener. Our team of tailgaters was full of some of the best cooks I know. Some of them, professional chefs in their own right. I threw down the gauntlet and challenged them all to bring their A-game to provide their best tailgating dish. I had one goal: Host the most epically delicious tailgate of my life. My brother-in-law Alex Metcalf is a fan of the Dallas Cowboys, but over time he has grown fond of my Chiefs. This was his first NFL game and the Arrowhead experience hit him just as hard. He is also literally the best cook in my family. He always takes the reigns on our family Thanksgiving feast and the meal is one of the highlights of my year. His tailgating dish was no exception. He made carne asada street tacos, using grilled sirloin marinated in lime and peppers, onions and cilantro in corn tortillas with salsa verde. The beef had been marinating for days and was truly succulent. Broadway Brewery came through for our tailgate in a big way. Not only did they send us with a keg of their delicious Kolsch and a variety of their popular Crowlers (can + growler = Crowler), they also sent us with their chef! Chris Pinter has been killing it in the kitchen at Broadway Brewery since he began working there earlier this year. His contribution to this event was no exception. Four words: Bacon. On. A. Stick. You read that right. Pinter house-cured locally produced Patchwork Farms pork bellies himself and thick sliced them to make one of the most mouthwatering tailgating dishes I’ve ever had. Dawson Claridge is the owner and proprietor of Amber House Bed and Breakfast in Rocheport. He’s a Denver Broncos fan, but we won’t hold that against him here. Even he can’t deny the allure of the KC gameday experience. His dish also featured local ingredients. He called it an “end of summer scratch chili” with cubed, slow braised pork loin from Patchwork Farms. The dish also featured tomatoes, peppers and onions from Rocheport’s Redbuds Farm, all mingling together for six hours in a slow cooker. He finished the plate with house pickled shallots and Goats Beard chèvre. John Shafer is a longtime friend of mine and a diehard Chiefs fan. We once made the pilgrimage to watch our Chiefs take on the Packers at Lambeau Field. I knew he would bring something special and he didn’t disappoint. 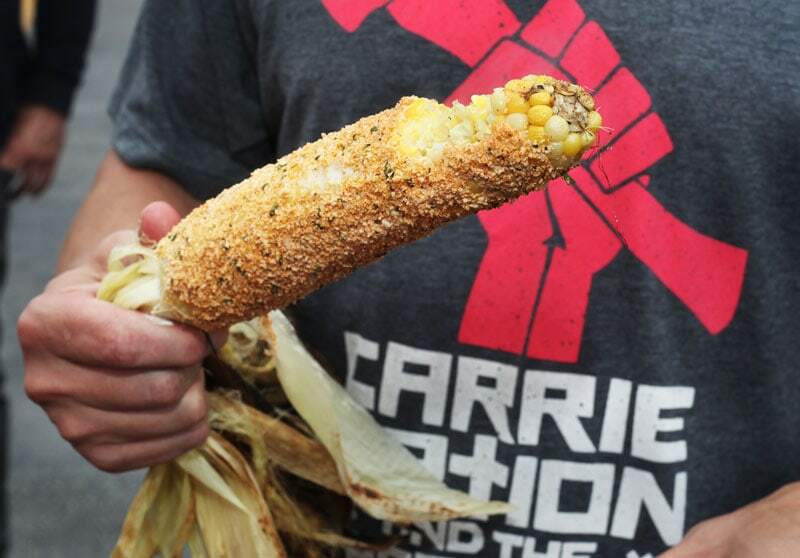 Aside from his signature chicken legs cooked in a house made spicy barbecue sauce, the real star of the show was his unique take on grilled corn on the cob. We slathered the hot corn with mayo (I covered mine in butter), and rolled it in a mixture of cotija cheese crumbled with chili powder, cumin, fresh cilantro and cayenne. It was dangerously good and a great item to kick off the tailgate with. I also took the time to traverse the parking lot, taking in the sights and sounds of KC fans doing their thing. With such trying times in the world, it was refreshing to see everyone united in jovial celebration. I thought back to my upbringing and my parents’ near contempt for such sporting events. Sometimes we need the distraction. Sometimes it takes a football game to bring a city’s worth of people together and allow us to forget about that which divides us. 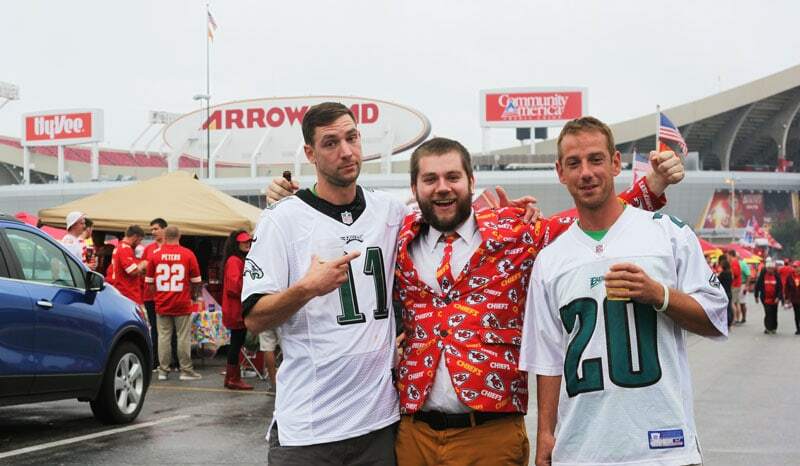 With the tailgate a resounding success, we headed in to watch the Chiefs beat the Eagles 20-27. The loudest stadium in the world was rocking and the whole crew had a blast. As I write this, the Chiefs are currently at the top of the NFL Power Ranking and whispers of Super Bowl abound. Of course, it’s a long season and by the time this is published their fortunes may have changed. No matter. Win, lose or tie there is an army of partiers that will be Chiefs fans until they die. I, for one, am proud to serve in the army of Chiefs kingdom.